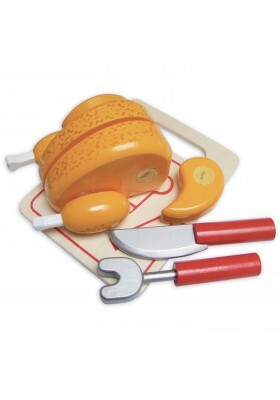 Vilac tests your carving skills with this Roast Chicken to Carve Game, with wooden utensils. 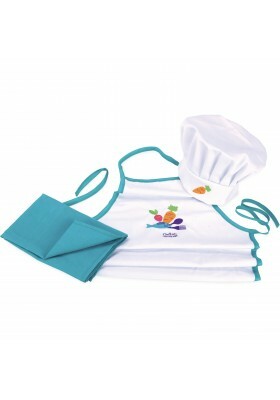 Tea towel, apron and Chef's hat: all you need to cook like a pro! 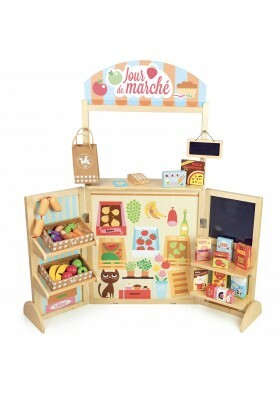 Market Stall Toy complete with fruit, veg and many other products, a credit card reader and many other accessories. 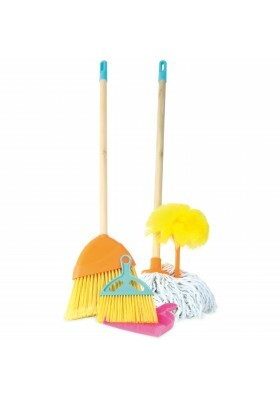 Foldable side panels for easy storage. 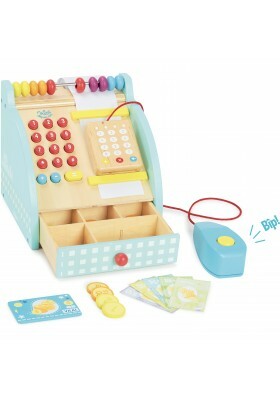 Inspired by the mobile street food trend, this small food stall selling hamburgers, chips and sodas comprises of many other accessories, is perfect for pretend play. 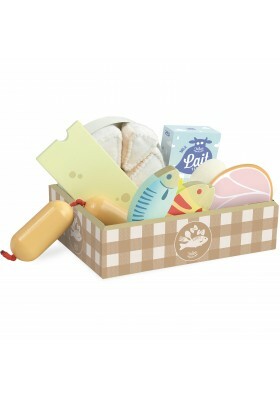 Lovely cardboard crate containing a carrot, a lemon, a radish, a leek, a aubergine, a mushroom, a tomato, a banana, a apple, a pear, a strawberry and two halves of an orange. 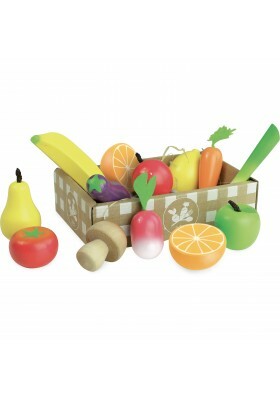 This set of wooden play fruit and veg is ideal to play shopkeeper. Superb wooden TV dinner consisting of a hamburger with 2 slices of bread, 3 salad leaves, two slices of tomato, a slice of ham and a slice of cheese. 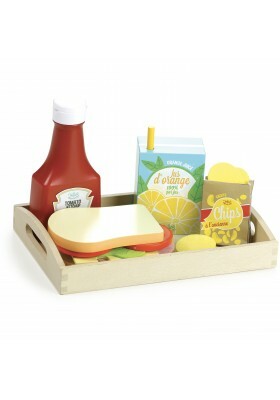 And to accompany the meal, a box of fruit juice with straw, a ketchup bottle and a packet of crisps to relax in front of the telly. 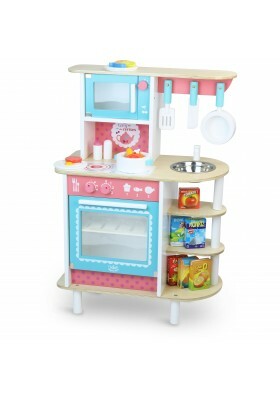 Kitchen unit Au Temps des Cerises""
Cook like mum and dad with this beautiful fully equipped wooden kitchen complete with great accessories. 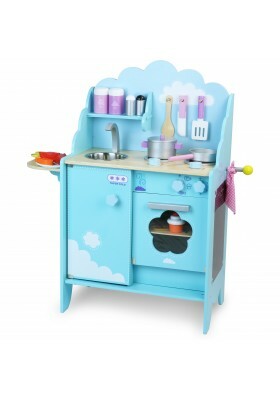 Ready, steady... cook! 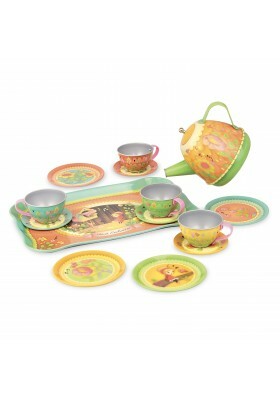 Lovely metal doll's tea set on an Enchanted Forest theme. When pouring tea, the tea pot plays a lovely tune. 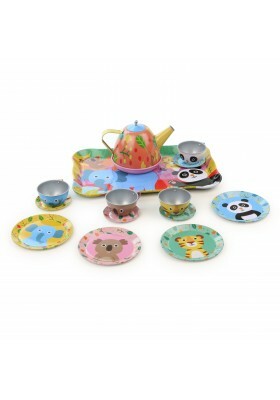 14 pieces: 1 tea pot, 4 tea cups with saucer and 4 plates. 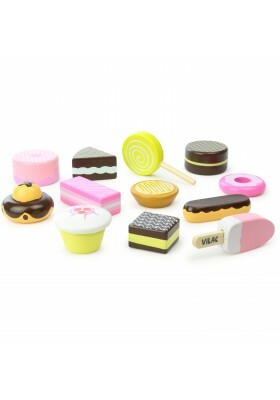 These twelve wooden cakes and treats are as yummy as real pastries! To eat without moderation! 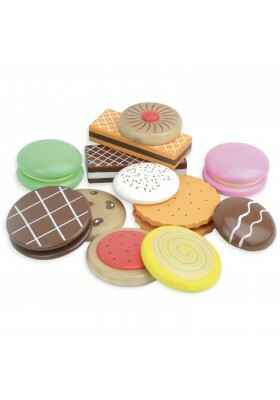 Little girls can now have a tea party with these scrumptious wooden biscuits! This lovely metal doll's tea set decorated with jungle animals contains a teapot, a tray, four plates, four tea cups with saucers and a decorated case to store it away.